This gorgeous Swallowtail Butterfly just turned up and flew around the Getropa flowers, feeding on the nectar it provided. It was obviously getting a lot of breakfast because it was still there after I had rushed off to grab my camera. What a beautiful start to December…There was not a single breath of wind outside this morning – thats really unusual. So many flowers still had last nights raindrops hanging from them. With the sun out in the blue sky, and the raindrops hanging motionless from petals, the flowers were glittering around me everywhere. I rushed back inside to get my Macro lens and monopod and hit the shutter button about 200 times… What a sparkling morning its been..
Maui Macro Photography, what the eye does not see – the lens does ! I’ve had fun with my Canon Macro lens, its a 100m IS USM, and a beautiful piece of kit when attached to my Canon EOS 40D digital camera. I used it with an extension tube, which enables me to get in even closer. A tripod is a must, and the cable shutter release makes shooting low shots easier. 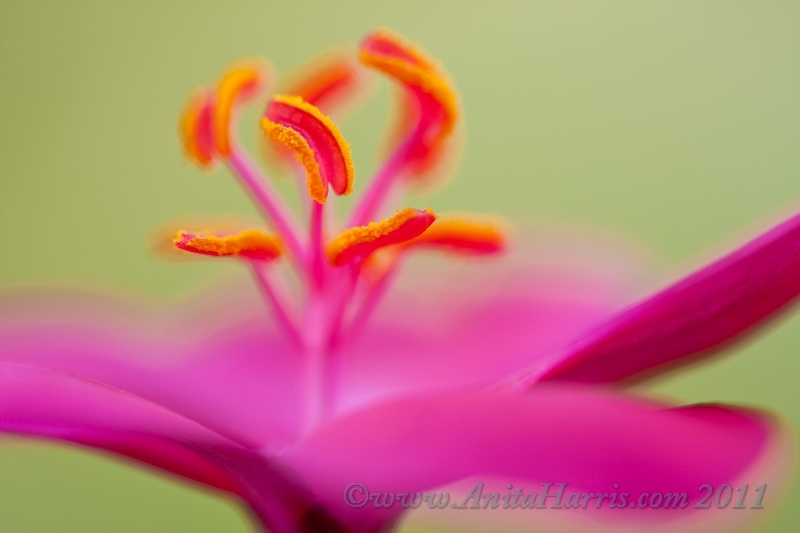 These closeup macro photographs were taken in Maui in the back garden, and I am very happy with my results. I think I am hooked. The weather has been very calm, with a slight cloud cover (which is perfect lighting) and ideally not a single breath of wind.